During the course of preparing for the holidays (decorating, tidying up for guests or holiday parties, etc.) 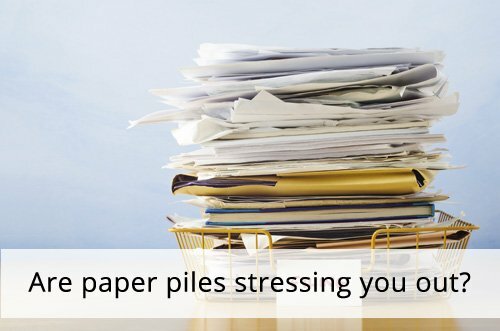 chances are that you’ll encounter a stack of paper that needs to be sorted through and dealt with. You might be tempted to stuff this paper into a bag to deal with later. But, if you’re like many people I’ve encountered over the years, “later” never really comes. Instead of stuffing and stashing, give this idea a try. First, take your stack of paper and flip it over. When you do this, the oldest papers in the stack are now on the top of the pile. Chances are good that while the paper has aged in the stack, decisions that were once difficult are now much easier to make—allowing you to gain momentum and feel a sense of accomplishment right from the start. Coupons may have expired or you may have bought a different item and no longer need the coupon. Or a newer version of the magazines and catalogs may have arrived in the mail, making the older versions less valuable to you and therefore easier to let go of. You may find notices for events that have come and gone, making it super-simple to pitch the invite. Turning the stack of paper over has another advantage. Many of the papers in the pile will now be facing downward. As you pull the top piece of paper off the pile to decide the appropriate action, you’ll be less distracted by the content of the next paper on the stack. This forces you to stay focused and make just one decision at a time—whether that is filing into a paper organizing system, taking action on the piece of paper, or tossing it and getting on with things! A pile of paper is literally a pile of decisions to be made. Each piece of paper represents at least one decision. Should I file this? If so, how long should I keep it? How am I going to remember to do this? If you have piles of paper that you need to address or if you struggle with the decision-making process, give my Organize Your Paper Clutter class a look. It will show you how to organize and file every piece of paper in your home using a simple, step-by-step process. Love the flip the stack tip – never thought of it that way but it is so true. Thanks!! Thanks Suzie! It works really well for stacks of paper that have accumulated over a long period of time. I really, really like this tip. What a great way to get rid of lots of stuff, and–equally important–build up confidence and momentum. Thanks! Thanks Nancy! And if there’s one place where momentum and confidence are needed, it is with paper. What a simple yet GREAT idea! Do you do this with clients as well? Do they ever get discouraged about finding things they feel guilty about because they didn’t get to deal with them in time? Still, the momentum idea is very nice. Great question Petra. There is often guilt over paper that has gotten old before being dealt with. I think that’s one of the reasons people avoid paper. Also, with clients I try to show them one piece of paper or category (if it is presorted) at a time so they don’t get overwhelmed. A few years ago, I was overwhelmed by papers relating to multiple trusts, estate matters personal papers, and other stuff. I purchased clear plastic boxes that legal sized papers would fit in. I sorted by person and by year, just sorting and no keep or toss decisions were made. I wrote up a list of what to keep in a permanent file (birth, death certificates, final tax returns, distribution signature pages, final IRS clearance letters, etc) and what else to keep for a specified time frame. The family attorney approved the list and time tables. Most boxes are stashed in a closet for now. I am keeping my current year filing up to date and when I feel like it, I work on an old box. It is a lot easier since I am working on old stuff and I am only looking for a limited number of items that have to be kept and the rest is shredded and recycled. Eventually, the boxes will be sealed, have a destroy by date and stored in the attic. That sounds like a fantastic system for dealing with paper backlog Liz. Thanks so much for sharing it. Such a great idea to have the lawyer look at your list and approve it! Gives you an added dose of confidence that you’re keeping and letting go of the right things. Thanks Tina! I’m so glad you found the tip helpful. Merry Christmas to you, too! Love this! Great point that you won’t be distracted as you go through each piece.